First “NBC Nightly News” removed a state from a fullscreen graphic and now tipsters are reporting that FTVLive.com spotted another graphics mistake in the world of TV news. This one involves KIRO-TV, the Cox owned CBS affiliate in Seattle. 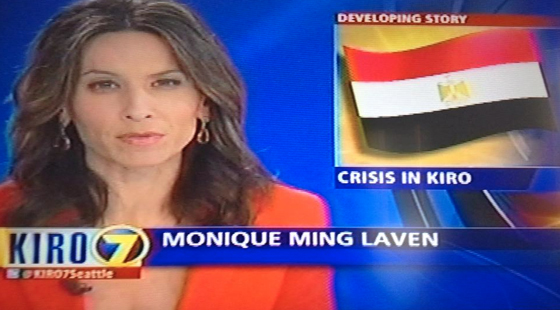 The station was reporting on the escalating tension in Egypt and aired the OTS graphic seen above next to anchor Monique Ming Laven. Rather than spelling”Cairo” C-A-I-R-O, someone at KIRO-TV typed in the station’s own call signs in the space below the graphic (which are also frequently pronounced as the word “Cairo”).